Building upon the work undertaken for the Urban ARK research project and under the leadership of Adriana Allen and Rita Lambert, the practice module of the Master’s Degree Programme in Environment and Sustainable Development has teamed up with the Sierra Leone Urban Research Centre (SLURC) and partners to set up a new learning alliance. Six interns, selected through a competitive process, will join each of the six student groups working in the following settlements: Moyiba, Dwarzarck, Cockle Bay, Susan’s Bay, Crab Town-Kolleh Town-Gray Bush, and Portee-Rokupa. 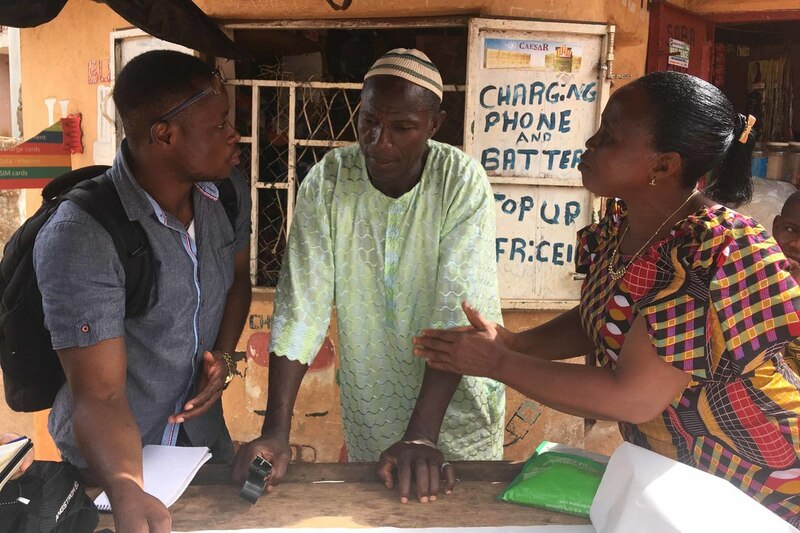 The research aims to contribute to an understanding of how and why urban risk traps or risk accumulation cycles affect local dwellers and their communities in Freetown’s informal settlements, and how they can be disrupted in a structural way. The ESD students have intensely prepared themselves for this fieldwork over the past months and developed conceptual and methodological frameworks to gather and analyse data in their study areas. During the fieldtrip, the interns will share their local experiences and knowledge and become important team members, who will support the grounding of approaches and the stimulation and facilitation of debates. The following six interns were selected among many applicants: Welcome them to our fieldwork team! Rita is a graduate of Fourah Bay College University of Sierra Leone with Honours in Bachelor of Science in Physics 2017. She writes short stories and believes in the power of words to induce individual and collective change. She has work experience as data entry clerk, enumerator in the Population Housing Census 2015, ballot box controller in the National Electoral Commission 2012, and as office assistant at the Forum for African Women Educationalist (FAWE) printing press. She also has experience working in issues of child protection, gender based violence, disability/elderly and nutrition. Abdulai has an MSc in Peace Studies and experience with disaster risk reduction assessments and stakeholder engagement. He is a dynamic team player, successfully collaborating with people from diverse backgrounds, culture, and professions. He is also passionate and committed to work, adhere to deadlines, possess interpersonal and good communication skills, personality and gender sensitivity; he has programmatic acumen to build capacities and work in hard to reach communities. Abubakar is an experienced, energetic and resourceful Social Worker; who has worked with community development organizations in all strata of society. He has gained over four years of work experience on thematic issues relating to research work under the Freetown Urban Slum Initiative Project. He contributed to the community profiling enumeration vulnerability and capacity assessment 2015; and also participated in joint research with students from University College London on “Learning for Resilience”; and several other communities’ needs assessment for small grants initiatives, advocacy and peer education. He has gained excellent communication, training and facilitation skills and the ability to work independently or as a valuable team member. Currently, he is working as the Advocacy and Small Coordinator for the YMCA Slum Livelihood Project. Henry David Bayoh has over nine years professional work experience in environment and development, with a passion for the environment. He is the Planning and Development Officer at the National Tourist Board (NTB) and serves as National Coordinator/Focal Point for Pan African Climate Justice Alliance (PACJA). Henry has an MA in Sustainable Development (Environmental Sustainability) from the University of Makeni, holds an Executive MBA, BSc. (Hons.) Environmental Sciences (Environment and Development), Advanced Professional Certificate in Conservation and NRM; Certificate in Project Management, M&E and a Certificate in Climate Change. He is a scientific member of Conservation Society of Sierra Leone (CSSL), member of YOUNGO, and Citizens’ Climate Lobby (CCL) Africa. Richard Bockarie is from Sierra Leone, and has a degree in computer science and five years professional experience in computer system development, data collection, management, analysis and mapping, community mobilization and engagement. Richard has facilitated several mapping exercises in Sierra Leone, Liberia, Ghana, Togo, and Kenya. He is part of the international data team for Slum Dwellers international (SDI), headquartered in Cape Town South Africa. Richard is the head of data collection for SDI affiliate in Sierra Leone with ability to use several data collection platforms/tools.